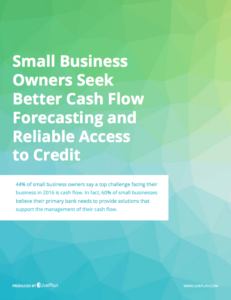 Pulling valuable data insights from Barlow Research Associates, among others, this whitepaper takes an in-depth look at what small business owners want from their financial institution when it comes to finding solutions for cash flow forecasting and accessing credit. The findings reveal some small business owners are still seeking advisors with the tools to help them succeed. The good news is that there are financial advisors with the right tools out there to help you strategize and forecast throughout the year to stay fiscally healthy, and to help you avoid preventable issues. At LivePlan, we encourage small business owners to seek out the right people. We even help you find them with our free, Expert Advisor Directory. Interested in the numbers? You can read the full whitepaper on Barlow’s website (complimentary to Barlow Research customers).